Your company is growing. Perhaps you’ve got new team members. A NuvoDesk Private Office membership offers the space you need. Save money and still grow your business when you become a Private Office member. You’ll receive your own set of access control cards to this dedicated space, and you’ll be able to customize it to suit your preferences. Brand your image and let your creativity surround you. This space is perfect as an executive office space, and it’s also ideal for teams wanting to enjoy a quiet co-working area. Even though you’re in a private office, you’ll still be able to tap into the NuvoDesk community. This community includes hard-working professionals and entrepreneurs just like you. Be inspired and be driven by your peers. As a Private Office member, you’ll get NuvoDesk perks including access to the video and production room, lounge area and other common areas. Get secure internet to assure your information stays private. 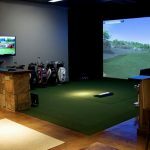 When you want to have some fun, visit the golf simulator. Enjoy a monthly contract and all the perks discussed on this page and even more. Set up a tour of our facility to see what we have to offer, or sign up today as a Private Office member.